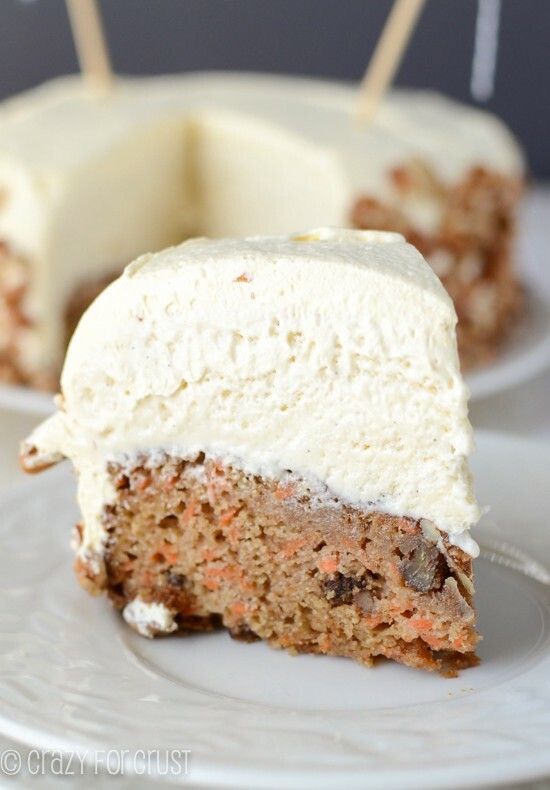 Carrot Cake Cheesecake Cupcakes are an easy way of combining carrot cake and cheesecake! 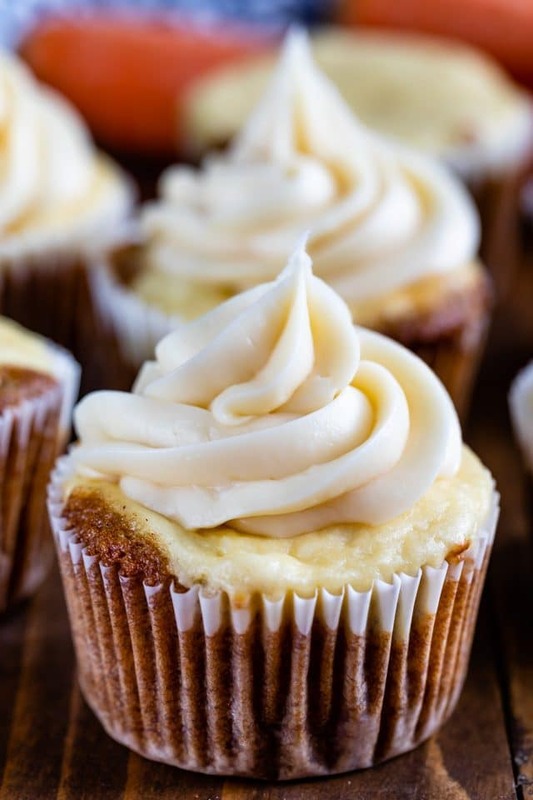 This easy cupcake recipe is the original cheesecake cupcake and is topped with a cream cheese frosting. Carrot Cake can fix anything. So can cheesecake. Together? They can run the world. I originally wrote this post back in 2012, can you believe that? I figured it was time for a redo of it because so much has changed since then. I now know how to write recipes, how to take photos, and how to make videos. It’s like a lifetime has passed since I first made these cupcakes for our contractor. We’d just moved into this house and it needed so much work and our old neighbor came and did a ton of it for us for cheap. I asked him his favorite desserts and he said carrot cake and cheesecake and I had a lightbulb Oprah moment and thought: CARROT CAKE CHEESECAKE CUPCAKES! Now, I don’t know if it’s coincidence or not, but ever since I posted these cupcakes, carrot cake cheesecake cakes (and other versions of cheesecake cupcakes) have flooded the internet. I posted these before Pinterest even existed (I know, right? What was it like without Pinterest?!) I like to think I started a trend (like I did with peanut butter snickerdoodles) so I’m considering this cupcake recipe to be the ORIGINAL Carrot Cake Cheesecake Cupcake. These carrot cake cupcakes got a redo when I wrote my cookbook but even since then I’ve improved my photography in spades. So…here we are again, and just in time for Easter! 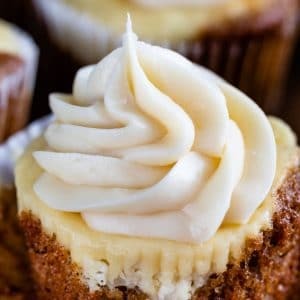 Carrot Cake Cheesecake Cupcakes are my favorite carrot cake recipe with a cheesecake topping and cream cheese frosting! I like to think of a carrot cake cupcake as a mini carrot cake. I mean…I guess that’s what cupcakes are: mini cakes. So, these cupcake are mini cheesecake cakes! You get a bite of cupcake and a bite of cheesecake and a mouthful of cream cheese frosting. These cupcakes look difficult to make but they’re super simple and come together in no time! This simple batter comes together with one bowl and a spoon. No mixer required! I cut down on the amount of oil in the cake by using some applesauce in place of half of it. 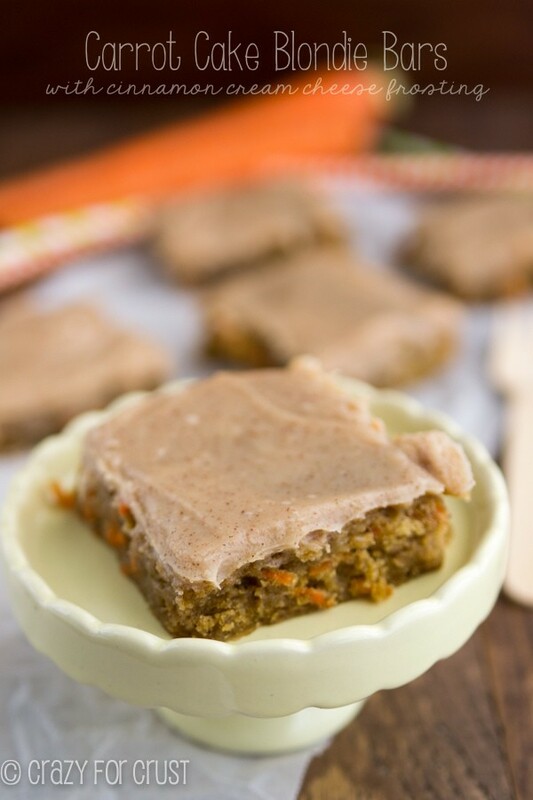 Carrot cake notoriously has a lot of oil, so using applesauce takes some of that out without changing the texture or flavor. Please use real carrots that you shred yourself; don’t use pre-shredded carrots. They’re too thick to get soft in the cake. Use walnuts or pecans, whichever you prefer, or you can omit the nuts. Similar to my mini cheesecake recipe, this cheesecake is great for topping cupcakes with. You can actually put this cheesecake on any of my cupcake recipes. Make sure your ingredients are room temperature to avoid lumps, even the egg. Otherwise your cheesecake will be lumpy! 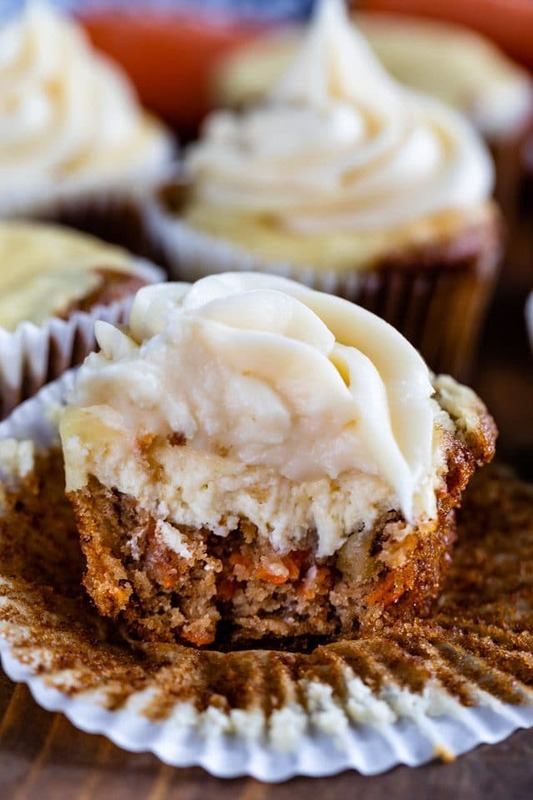 This recipe makes 12 perfect Carrot Cake Cheesecake Cupcakes. If you want a bite size version, make MINI Carrot Cake Cheesecake Cupcakes using mini muffin pans (it’ll make about 4 dozen). Preheat oven to 350°. Line muffin pan with liners. Set aside. Make the cake batter: In a large bowl, beat together egg, applesauce, oil, sugars, and vanilla. Mix in flour, baking soda, baking powder, salt, and cinnamon. Stir in carrots and nuts, if using. Pour evenly into 12 muffin liners (about 2 tablespoons per cupcake). Set aside. Make the cheesecake batter: make sure all ingredients are room temperature to avoid lumps. Mix together cream cheese, sour cream, egg, sugar, and vanilla with a hand-held mixer. Pour evenly on top of cake batter in muffin pan (about 1-2 tablespoons per cupcake). Bake for about 18-25 minutes, until cheesecake is no longer runny. Cool completely. Chill at least 1 hour before serving. You can frost them once they're room temperature, but don't serve until they've chilled a bit so the cheesecake can set. Make the frosting: Using a hand mixer, cream butter and cream cheese until fluffy. Slowly add in powdered sugar and vanilla. Mix until smooth. Frosting option: use a 1M tip for a beautiful cupcake. Store in refrigerator for up to 3 days or freeze unfrosted cupcakes for up to 1 month. 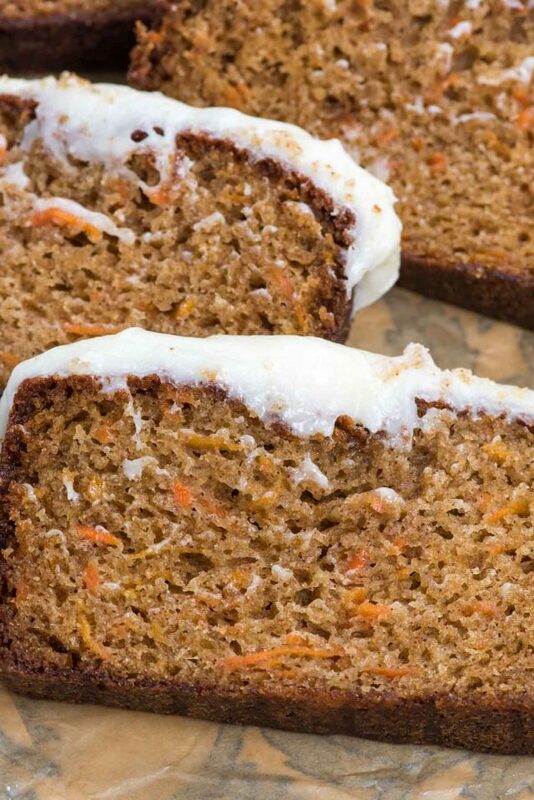 Click here for more Carrot Cake Recipes! Post originally published Jan 9, 2012. Photos and text updated 2019. I want to make these for my job holiday party tomorrow and wanted to know how to store them? Do i put the cupcakes in the fridge once cooled without frosting? OR do I even need to place in the fridge? I’ve already made this recipe for a family gathering the same day they were eaten so im wondering about next day consumption. P>S- this recipe rocks & is def a hit! I like to store them in the fridge because of the cream cheese. They taste better once they’re a little room temp though. Glad you like them! 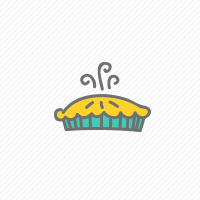 Any chance this could be made as a full sized cake rather than cupcakes? If so, any suggestions? Thanks so much! I just made this but I had to make do with what I had in the house due to the snow outside. I substituted the oil for the same amount of unsweetened applesauce, and made it in a 9 inch cake pan. It took about 30-35 minutes in the oven. It turned out great, thanks!! 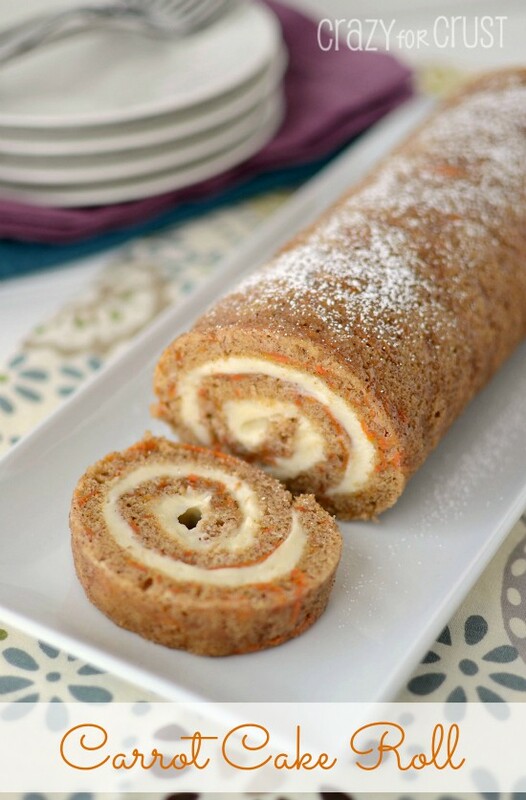 Carrot cake with cream cheese is one of my favorite desserts.